I had the opportunity to try this one at a Rare Malts tasting from a freshly opened bottle, and then a few weeks later from another bottle that had been open for a while. I think my nose got more out of the second run, but it did not change my total feelings with regards to the whisky. Good and personable, but not majestic. 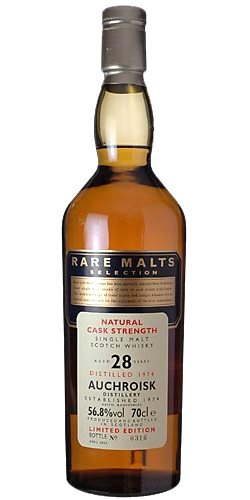 Tasted with Rare Malts Millburn 35yo 1969 (85 pts. 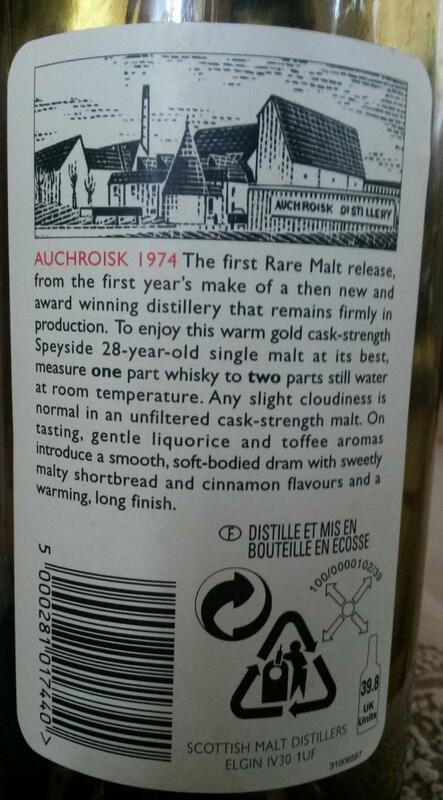 ), Dufftown-Glenlivet 21yo 1975 (84), Linkwood 22yo 1972 (92), Dailuaine 22yo 1973 (89), Teaninich 27yo 1972 (88), and this one. Thanks to member Mr. Sandwich for the sample! Fruitiness and dry oak at first. Some fairly tannic cognac, with faint echoes of perfume-y bourbon? Some time later a wisp of breath mints. The nose is a bit damped by the alcohol despite not having an unusually high ABV., but it's also nicely refined and not at all vulgar. With water: peppers, some dry and dusty malts, and vanilla. Cognac with hints of bourbon, dry oak, and some echoes of dark chocolate. Some fattiness. With water it's spicier, less on the cognac, and a bit peaty in that dry highland style. More water keeps it as it is, with the neat profile's subtle fruitiness and fattiness staying in the back seat. The peat and the spices (blackpepper, allspice) sink into my gums. Long, but not particularly vivid. With a lot of water the tail gets metallic. Bottle # 2924 sold empty at ebay. When I bought this bottle it cost me less than €150 and that isn't so long ago. Ok a few years have passed. 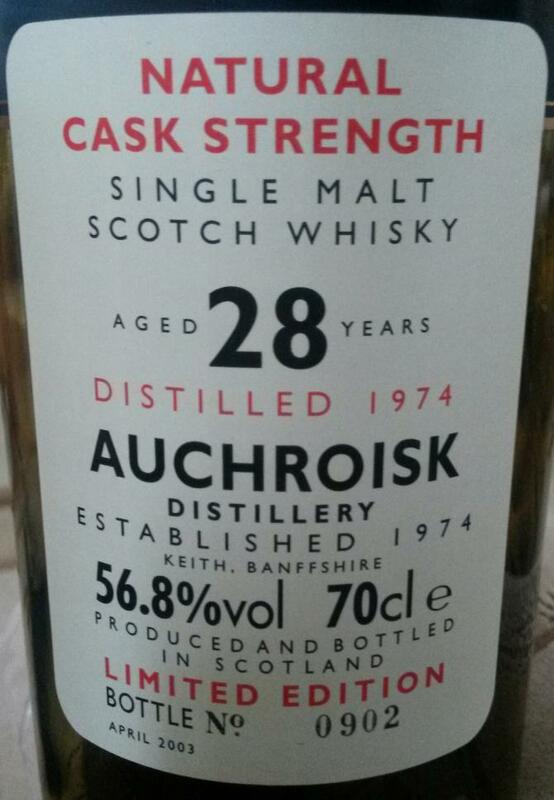 When my eldest son reached legal drinking age, I opened it up and he had his first dram with dad. It took us close to two years before we got to the end of the bottle, some may say that was too long, but we enjoyed ever drop of it thouroughly. In fact, I filled the last 0.1L into a small bottle, sealed & labelled it and gave it to my son when he reached 21. [February, 2006] Together with friends I emptied bottle no. 2918 that I bought for 61 Euro in July, 2005. A medium- to light-bodied, sweet and low-peat whisky with no pronounced sherry notes. Restrained , opens up with water. An after-dinner dram? Gentle hint of peat, like a bonfire at a distance. Baked apples. Drying, newly cut grass. Malty, cereal and cooked mash. A whiff of beeswax and vanilla.Spicy,licorice and crushed aniseed. Light, clean and sweet. Creamy with traces of walnuts. Woody edge, slowly erased by the vanilla and walnut notes.